Encourage the explorer in your child by giving their bedroom a safari theme. Gender neutral, a safari theme is perfect for toddlers and young children. Adding educational elements will help them on their voyage of discovery and learning, from recognising animal names, colours, shapes and nature, albeit in a child friendly manner, will transform their room into a place they'll love to spend time playing and of course sleeping. There are different ways to approach the décor, bear in mind that it should be 'age appropriate', this means don't try and cram too much in otherwise they will become confused and overwhelmed and you should ensure that any educational elements are related to the age of your child. Primary colours are ideal for children's learning and development. Using a pale neutral for the walls will enable decoration by means of murals, posters and artwork to take centre stage. Try and keep to colours associated with going on a safari, such as greens and yellows. Other bright colours can be included as accents via soft furnishings and window blinds. Flooring should be child friendly too, carpeting provides a soft and warm texture underfoot and while light colours can enhance the finished outcome, it's worth remembering that accidents and spills will happen and they'll show more on paler colours than they will on mid and darker tones. A safari Jeep bed would be a fabulous addition to the room, however, bedding with a safari theme is just as ideal. Likewise, window treatments that tie the theme together should also be used. 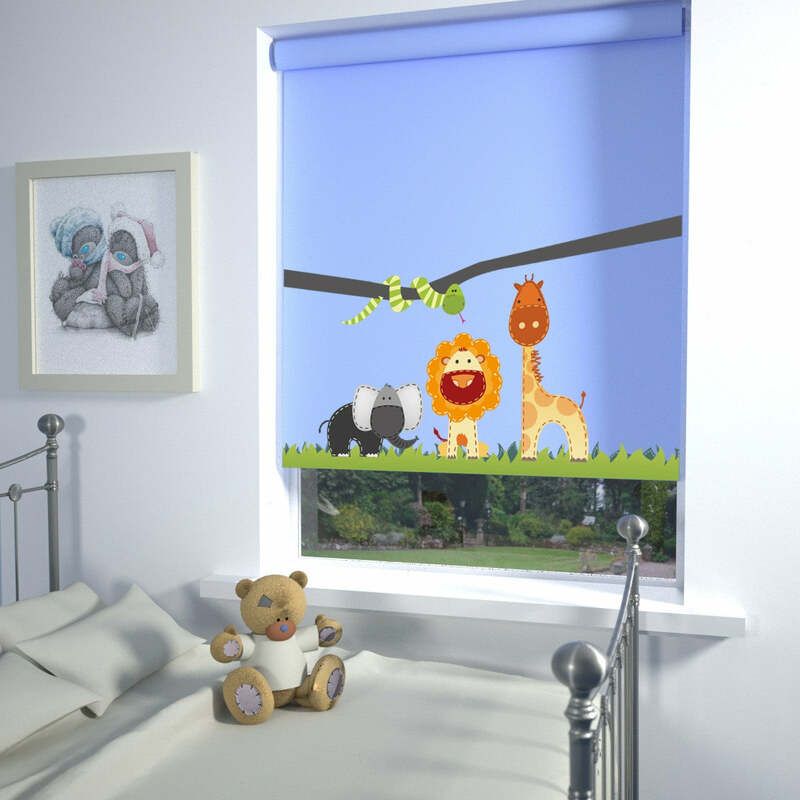 Opt for custom blinds which have cute jungle animals and your child's name printed across the bottom. These vibrant, cheerful childrens blinds not only look amazing they will help your child to learn the spelling of their name and make their room personal to them. They are digitally printed on PVC for durability and easy cleaning, and have blackout properties to help stop unwanted light from entering the room day and night. Printed blinds with scenes of jungle animals, flora and fauna would also look in keeping with the theme and can be used as 'doors' for open shelving, as well as windows. Accessorising with safari related scatter cushions, floor rugs and soft toy animals can also be used to create a cohesive theme that children will enjoy. As your child grows a safari theme can be adapted and built upon, for example cute jungle animal walls murals can be exchanged for animals which are more realistic or digital prints of animals in their natural surroundings; bedding can also be up-dated to suit the age of your child, however, there is one aspect you should keep irrespective of their age and that's the custom blind with their own individual name on!